There's no doubt about it - teaching is hard. But as followers of Christ, the way we deal with these challenges should be radically different than how everyone else does. Because we have Christ, and He changes everything. There’s just no doubt about it. Teaching is tough. Yes, it’s wonderful. Yes, it’s rewarding. Yes, it’s an incredible job and calling. But it’s also really tough. And I don’t have to tell you why – you already know. You’re experiencing all of it right now. You might even be starting to buckle under the weight of it. How are we supposed to respond when the challenges of teaching loom larger than the joys, when we’re overwhelmed and under helped? When, if we’re being honest, we’re wondering if we can keep doing this much longer? Well, if this were the typical teacher blog I’d tell you about how amazing you are and how you can totally do it! I’d remind you of all the kids that need you and the difference you’re making. I’d advocate for self-care and self-appreciation and tell you to take some time to do something you love. But here’s the thing – while there’d be a few nuggets of truth in all that advice, it would be actually be missing the entire point. In some cases, it would even be obscuring the whole point – at least, certainly for any follower of Jesus. Because, as followers of Christ, how we face adversity should be radically different than how our colleagues face it. Why? Because we have access to the true Answer, the unending Source of strength, the sure Rock and Rest and Hiding Place when challenges buffet us on every side. Because we know the true meaning of life, the reason for our sacrifice, and the high calling given to us in Christ Jesus. Yes, Jesus changes everything, but what exactly does this look like? Let’s think it through together…. 1. We need to know who we are in Christ. We must start by understanding – and remembering – that our identify is found in Christ and Him alone. He has given us His Righteousness and made us His sons & daughters. We are in Him and He in us. But often we forget this and instead try to find our identify in other things – like the approval of our principal, good marks on our evaluation, our own sense of accomplishment, or the success of our students. And when we’re looking for value and worth in these other things (anything other than Christ), we set ourselves up for a terribly hard time. Because as soon as these things start to go wrong (and, inevitably, they will), we start to feel worthless, invaluable, incomplete. We lose our sense of identity and start to flounder. What we must do is turn back to Christ and remind ourselves of who we are in Him. That who we truly are has nothing to do with how good of a teacher we are and everything to do with what Christ did for us. When we see ourselves as He sees us – redeemed, set apart, declared righteous, loved – we are freed to pursue excellence without the chains of fear and self-doubt holding us back. 2. We must realize that life isn’t about being happy. Our culture tells us to pursue our own happiness, but that is not at all what our goal should be as dedicated Christ-followers. No, the Bible makes it clear that we are pursuing something higher. We were created, above all else, to glorify God. His glory, not our own happiness, should be our daily aim. We can and should glorify God in the good times, but it is often during the difficulties and the challenges that we can best showcase His grace and testify of His goodness. So when teaching gets hard, rather than bemoaning how unhappy we are, let’s take a higher view. Let’s look for opportunities to give God glory. Let’s remember that God has a plan that’s bigger than ours, and let’s look for the meaning behind the challenges – meaning that goes far deeper and accomplish far more good than our temporary happiness. 3. We must trust that God has given us these challenges for a reason. At this point, we have a choice to make: Do we trust God or not? Do we believe that He is in control, that this challenge has been either appointed or allowed by Him? Do we trust that He has a purpose and that He will bring good from it, even if we don't understand right now? You know, sometimes God brings us into difficult circumstances because He has someone He wants us to help. Maybe that student who is seriously making you consider quitting has actually been placed into your life by God because He wants you to reach them. Maybe that administrator who’s about to drive you to insanity is actually hurting inside, and God wants you to be His vessel to show them His love. Yes, God may have someone He wants you to reach in this tough time. Or it may be that God is bringing you through difficult trials to teach you something. That means that when teaching gets hard, we should be looking for ways to grow through the challenge. Ask God to do His work in you and be open to the lessons He is trying to teach you. 4. We must surrender to God’s plan, even if it means giving up our own. Will we surrender to His plan or hold on to our own? Let’s be honest. Just because we believe God is in control doesn’t mean we like what He's doing, and it doesn’t mean we automatically submit ourselves to it. No, that is a choice we must make. A conscious choice to surrender our own hopes, dreams, and plans to God’s. So if you’re in a teaching situation you flat out don’t like, but you know God has you there for this time, what are you going to do? You can complain and gripe and hate every minute of it. Or you can choose to trust God’s good plan and surrender your desires to His. It’s not easy to let go of our own dreams, our own desires, our own ideas of how we thought things would go. But when we do – when we tell God that this is what we want but that we choose to accept His plan instead – an amazing thing happens. That incredible peace that passes all understanding fills our hearts. And we can finally rest – even in the midst of the challenges – in the knowledge that we are right where we’re supposed to be. If you’re having trouble wrapping your mind around this, please consider joining us in Teach Uplifted. In this program, we take six weeks to explore exactly what it means to trust in and surrender to God – and how that translates into everyday life. 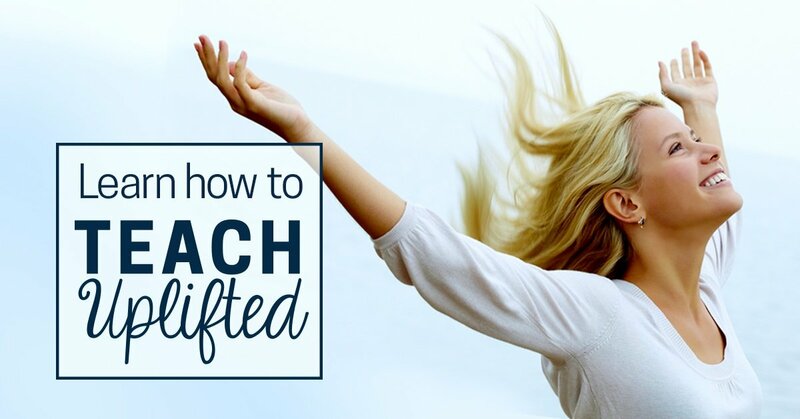 Find out more about Teach Uplifted here. *small but important caveat: Am I saying that you should never switch grade levels, look for a new school, or possibly give up teaching? Not at all. God may, in fact, guide you in this direction. But the point is that just because something is hard doesn’t mean we should be looking for a way out. We shouldn’t be taking matters into our own hands, determined to fix the problem ourselves. We must trust in God and surrender our will to Him. Then, and only then, are we able to truly seek His plan and hear His voice leading us to either stay or go. 5. We must abide in Christ & teach in in His strength, not our own. So if we’re tracking together so far, we’ve settled our question of identity, realized that life isn’t about being happy, chosen to trust God, and surrendered to His plan. But what about the day-to-day? How do we actually live out each difficult moment with grace, love, patience, and joy? There’s only one possible way: we must abide in Christ. It’s that simple. Without Him, we can do nothing. But when we are in Him, we will bear much fruit – we will be full of love, joy, peace, patience, kindness, self-control. Not because we are so great but because His power is flowing through us and His Spirit is producing His fruit in our lives. So what exactly does it mean to abide in Christ? In a nutshell, it means to give our lives to Him and to ask Him to change us. To surrender our will to His each day and to choose His ways over our own desires. To spend time with Him and to know Him and His Word. 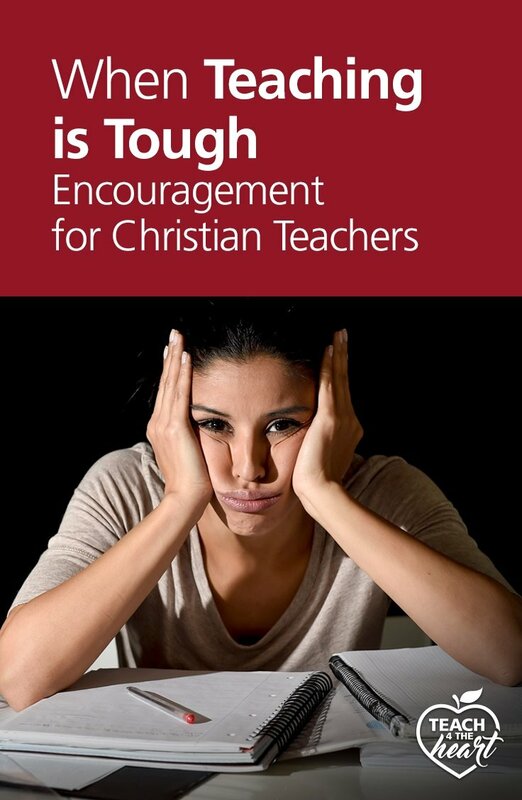 We explore this concept together in much more detail in Teach Uplifted, which is all about finding joy in teaching through Christ, even when things are difficult. I hope you can join us there! 6. We must make time for rest and spiritual refreshment. Self-care may be a buzz word these days, but there's more than a little truth to this concept. God designed our bodies to need rest and our spirits to need refreshment. When God created the world, He rested on the seventh day. Now we don’t think for a minute that He was actually tired, but He took the time to rest as an example to us of what we need. We need time away. We need down time. We need space to reflect and reconnect with our Savior. Too often as teachers we get this martyr syndrome that says we just need to keep pushing – and pushing – and pushing – and pushing – regardless of the toll it is taking on our bodies, our spirits, or our families. But, once again, we’re ignoring God’s pattern of rest and Sabbath. If Jesus rested in the middle of the storm, maybe we should, too. And that means sleep. Yes, actually sleep. It also means inward renewal. This can – and should – come from Bible reading and prayer, but it should also come from activities that energize us. So, please, let's not try to be martyrs – or Superheros. Let's embrace the way God has created us and prioritize some time for rest and refreshment. It’s amazing how much easier it is to think clearly (Biblically) and face our challenges correctly (abiding in Him), when we’re rested and refreshed. Thanks for walking through these heavy thoughts together. I know it’s not common advice, but I believe it’s what we truly need in order to thrive through all the challenges of teaching. And while I pray this article has been helpful, I also realize that one article probably isn’t enough. Dismantling wrong thought patterns and replacing them with truth isn’t easy and often requires discussion and meditation over an extended period of time. Find joy in teaching again through Teach Uplifted. This article arrived in my inbox right on time! Today has been “one of those days”, and a colleague and I were just discussing our woes of the day before heading home from work. Thank you for reminding me who I am and why I teach! I love this! I’ve really been seeking to “look different”–to really let my light shine at school! Thank you for the reminders and encouragement! Thanks so much for writing this. It came just when I needed it. Keep up the good work! I love this site!